All organizations are experiencing explosive data growth. Data growth continues to accelerate at almost exponential speed and with that comes pain points of organizations trying to manage that growth. More data means more robust applications to handle larger data sets, which also means more infrastructure to handle applications and the data itself. While the cost and management of on-premises storage has come down as hardware and disk technologies improve, organizations still face significant overhead when maintaining their own hardware infrastructure. Taking that a step further as it relates to backups, when you combine the growth of data together with more strict regulations around data retention, the challenges that come with managing storage platforms for production and backup workloads becomes even more complex. The reality persists that organizations still struggle to achieve the economy of scale both from an operational and cost point of view that makes storing data long term viable. Object Storage has fundamentally shifted the storage landscape, mainly due to its popularity in the public cloud space but also because it offers advantages over traditional block and file-based storage systems. Object Storage overcomes many of the limitations of file and block due to its design and fundamental concept of being able to scale out infinitely. Because a large percentage of backup data is considered to be for long-term retention. 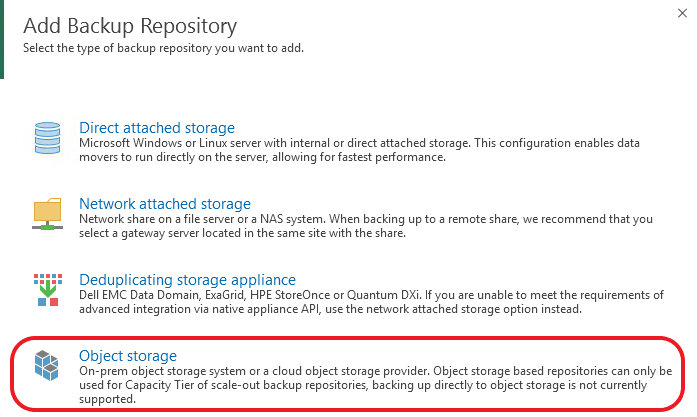 Object Storage seems to be a perfect fit. 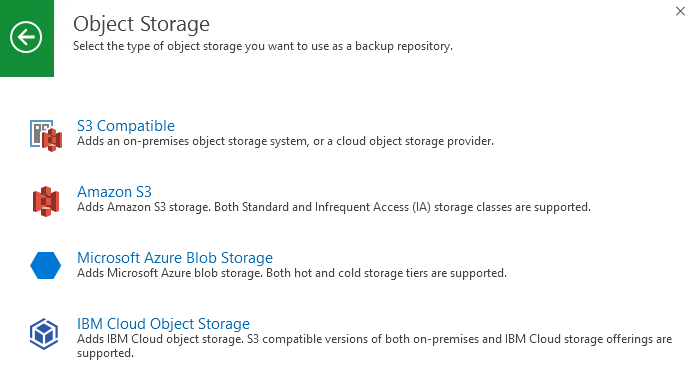 Though the likes of Amazon, Azure and IBM Cloud offer Object Storage, the amount of organizations that have deployed Object Storage to their on-premises environments remains relatively low. The popular trend is to consume cloud-based Object Storage platforms to take advantage of the hyper-scalers own economies of scale which can’t be matched. With the cost of storage at fractions of a cent per GB, organizations desire to consume cloud-based Object Storage has increased and many have been made aware of its benefits. The innovative technology we have built into this feature allows for data to be stripped out of Veeam backup files (which are part of a sealed chain) and offloaded as blocks of data to Object Storage leaving a dehydrated Veeam backup file on the local extents with just the metadata remaining in place. This is done based on a policy that is set against the Scale-out Backup Repository that dictates the operational restore window of which local storage is used as the primary landing zone for backup data and processed as a Tiering Job every four hours. Just stepping back to think about what that mean. With Veeam Cloud Tier you are now able to recover or restore directly from Object Storage without the need for any additional, potentially expensive components. With that, you can start to understand just how innovative a feature Veeam Cloud Tier is! In addition to that, we have built in further space saving efficiencies in the form of effective source side dedupe where by the same blocks of data are not offloaded to Object Storage, reducing the amount of consumed storage and reducing data transfer times up to the Capacity Tier. We have also added Intelligent Block Recovery that will source data blocks from the local backup files instead of what is tiered to Object Storage resulting in not only faster recovery times, but more importantly, cost savings when pulling data back when using Object Storage services that charge for egress. For all Veeam customers and partners, both end users and VCSP partners alike, Veeam Cloud Tier represents an important inflection point in the way in which backup repositories are designed and built. No longer are there limitations on how big backup repositories can grow before complications arise from the accelerated growth of data. We have leveraged the power of the cloud with the efficiencies and cost savings of Object Storage platforms to deliver a feature that is unique in the market and we have been able to deliver this in such a way that no industry leading Veeam functionality has been lost. Update 4 is now Generally Available and can be downloaded here. The post Harness the power of cloud storage for long-term retention with Veeam Cloud Tier appeared first on Veeam Software Official Blog.